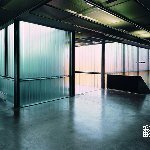 The genesis of the project starts from a basic minimum cell, which as the minimal optimal space can be multiplied, adopting dimensions and structures depending on different uses. With this, the building is able to achieve a high flexibility, according to the ever changing requirements for this kind of program. The building re uses the “didactic” european tradition, the cloister concept as form structure: this way the program is articulated around a patio. The “clothes”, acting as “veils”, with different transparency levels, responding to the mimetic abstract relation with the surrounding natural environment: the subtle reflections (as spider webs), the shiny baroque tones, with big embroideries, in front of the naked tree trunks in the winter or with the colorful autumn leafs. In this building the photography is “almost fake”: it´s only true at the time of the “click”… the rest of the thousands of moments, the building is different, each moment.. different.